So this is like a month overdue, but well worth sharing. For Ryan‘s birthday, there were like 30 of us that all went out for a sail in Santa Cruz. Yeah, that’s how we can roll out here on the coast! The plan was to sail out and anchor near the pier. Then we had a little dingy that was supposed to ferry people to and from the pier to get drinks and have dinner. 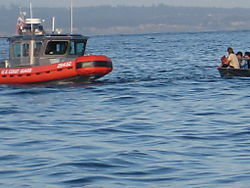 Yup, a visit by the Coast Guard. Unfortunately, they didn’t exactly have everything they needed. 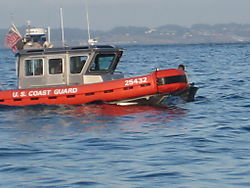 So next, the Coast Guard came by our boat. And boarded. It ended with them pretty much hangin and partyin with us, and making some nice inappropriate passes at eh ladies. Made for a good story and some great times though! Oh…and of course I got a bunch of it on video. Glad I had the SD1000 handy. Always gotta be ready for bloggable material! Dude…. Wheres the link love at? This was arguably one of the best nights of my life. I cant wait till my birthday next year, although i am not sure how we will top this. Uh, WOW! They really DID hang out with you!